BANGI, 3 November 2014 – Malaysia should be more vigilant for symptoms of communicable diseases that are spreading rapidly across the world. 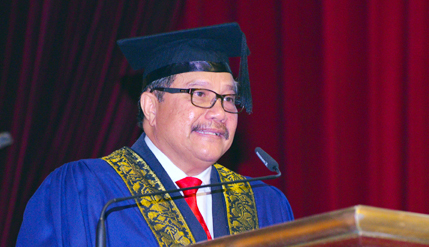 Former Dean of the Faculty of Health Sciences of The National University of Malaysia (UKM), Tan Sri Prof Dato’ Dr Mohd Salleh Mohd Yasin said although the country has successfully managed to bring some infectious diseases under control there are now other health issues threatening the world. He urged the authorities to step up research on non-contagious diseases such as heart disease, cancer and diabetes that now make up 60% of all medical cases in the country. Speaking after being awarded Emeritus Professor by Chancellor Tuanku Muhriz Ibni Tuanku Munawir at the 5th session of the 42nd UKM Convocation here today, he said such threats would adversely affect the country in the future. Efforts to eradicate infectious and non-infectious diseases had been been agreed to by the United Nations under the Millennium Development Goals in 2000. Prof Mohd Salleh hoped that UKM would continue research efforts towards preventing such diseases. He was the first dean of the Faculty of Allied Health Sciences at UKM established in 1992, the first in the country to offer Bachelors degree courses. Prior to that other universities only offered such courses at the diploma level. A highlight of his career was in 2003 when he was appointed UKM’s Vice-Chancellor, a position he held until his retirement in 2006. Prof Mohd Salleh started his career at UKM in 1974. He was appointed a tutor in the Department of Medical Microbiology and Immunology, Faculty of Medicine. Following that he pursued his studies receiving his PhD at the University of Bath, in the UK.